Some scientific education doesn't come from textbooks. While studying chemistry, I was told that bearded chemists had more luck crystallizing products from solutions. The apparent reason was that crystals need to nucleate, and the dust from a chemist's beard provides such nuclei when it falls into solution. Perhaps this is another reason for the gender gap in the sciences. Water should crystallize to ice below 0°C, but it's possible to have liquid water, supercooled water, below its freezing point, since the ice hasn't nucleated. Supercooling was first identified, in 1724, by Daniel Fahrenheit (1686-1736), for whom the Fahrenheit temperature scale is named. It's actually very easy to supercool water, and there are many examples of the flash freezing of supercooled water on YouTube. Water in a plastic bottle can be placed in a kitchen freezer, and the smooth interior of the bottle doesn't allow nucleation, so the water is supercooled. Striking the bottle on a surface causes a pressure wave that freezes the water. Plaque at Daniel Fahrenheit's birthplace in Gdansk, Poland. Although born in Poland, Fahrenheit spent most of his life in the Dutch Republic, and he is considered to be one of the principals of the Dutch Golden Age. Clouds are composed of ice, and they pose no threat to passing aircraft. Supercooled water can exist in the atmosphere at temperatures between 0°C and -48°C, and this water can solidify as ice on aircraft, causing flight problems, and some fatal air crashes. Icing is also a problem at ground level, where supercooled water can ice overhead electric power lines, wind turbines, and other structures. I know there's an aircraft in here, somewhere. This is a 1983 photograph of an icing test at the NASA Icing Research Tunnel at the Glenn (formerly, Lewis) Research Center. A research team from the Harvard Medical School, Shriners Hospitals for Children (Boston, Massachusetts) and Rutgers University (Piscataway, New Jersey) reasoned that nucleation of freezing of supercooled aqueous solutions will likely start at the interface between the liquid and air, as our bearded chemists have shown. They decided to see whether solutions could remain supercooled for extended periods as as means to extend the shelf life of such biological solutions as human red blood cells. They found that by protecting this interface with a layer of oil and other hydrocarbon liquids such as pure alkanes and primary alcohols they were able to achieve supercooling down to −20°C of 100 milliliter volumes of water for up to 100 days, and they were able to preserve human red blood cells for 100 days. Although it was conjectured that the reason why water and other liquids supercool was that the arrangement of molecules in the liquid was incompatible with crystallization, the mechanism of supercooling was not elucidated until recently. A five-fold coordination of molecules would be incompatible with the periodic repetition of molecules in a crystal, since a five-fold structure is not space-filling. Finally, in 2010, scientists from the Commissariat à l'Energie Atomique et aux Energies Alternatives (CEA) of the Centre National de Recherche Scientifique (CNRS) and the European Synchrotron Radiation Facility did an experiment with a gold-silicon alloy that proved that five-fold coordination of molecules in the liquid is responsible for supercooling. Magazines of the 1950s published many articles about science and technology. It was science that won World War II, put a chicken in every pot, and an automobile in every driveway. One thing that I remember of that decade was the plethora of articles about cloud seeding to make rain. Unlike other forms of rainmaking, cloud seeding has some science behind it, the same scientific process exploited by our bearded chemists. Cloud seeding uses crystals that act as a nuclei for the growth of ice, the ice particles becoming so heavy that they fall to produce precipitation. The unlikely pioneer of cloud seeding was General Electric, where in 1946 Vincent Schaefer and Bernard Vonnegut, the brother of author Kurt Vonnegut who also worked for a time at GE, found that crystals of silver iodide would efficiently nucleate ice in a supercooled water atmosphere. Schaefer and Vonnegut conjectured that the ice nucleating propensity of silver iodide was caused by its hexagonal crystalline structure which matches that of ice, but scientists are still uncertain as to whether this is the true cause. Interestingly, proteins that exist at the surface of Pseudomonas syringae bacteria will also act as efficient ice nucleating agents. While cloud seeding was developed more than 75 years ago, it's still unclear as to how well it works. In 2015, the Wyoming Weather Modification Pilot Project (WWMPP) completed a six year study on the effectiveness of cloud seeding. Conducting more than 150 test during the winter months in the mountains of Wyoming, the study found that seeding increased snowfall by 5-15%. While the statistics of this study are not that robust, it appeared that all trials increased snowfall by a measurable amount. radar observations also indicated that the seeding had its desired affect, although it was not possible quantify the results. An earlier report on weather modification by the National Academy of Sciences concluded also that quantitative results from cloud seeding experiments are difficult to obtain. Location of the Great Plains on a map of the United States. This map shows the different temperate grassland types, with the lighter colors indicating the more arid regions. Attempts to prove or disprove this idea have resulted in scientific publications with conflicting results. These studies showed that wet soil would increase, decrease or not change precipitation. University of Arizona doctoral student, Joshua Welty, and his thesis advisor, Xubin Zeng, have just published a study that attempts to clarify the rain/plow effect. [5-6] These scientists are in the University of Arizona's Land-Atmosphere-Ocean Interaction Group. In their study, they quantified the relationship between soil moisture and increased precipitation over the U.S. Southern Great Plains. As Zeng explains, while moisture is needed to make rain, you also need an upward motion of air from the earth's surface into the cool upper atmosphere. The Arizona study analyzed open-source data from the U.S. Department of Energy's Southern Great Plains (SGP) atmospheric observatory in southern Kansas and northern Oklahoma. These data were selected from that of the June to September warm season from 2002 to 2011, and the Arizona team examined how morning soil moisture affected afternoon rainfall accumulation. "The dry soils that enhance afternoon rain are acting like conveyor belts for warm air that's being sent into the upper atmosphere... Combine that upward motion with moisture and a water vapor source, and the result is afternoon rain." When the wind conditions are taken into account, rainfall can be influenced by land surface conditions. Cultivating the soil could be a method of cloud seeding under the right conditions. The University of Arizona research was funded by NASA. 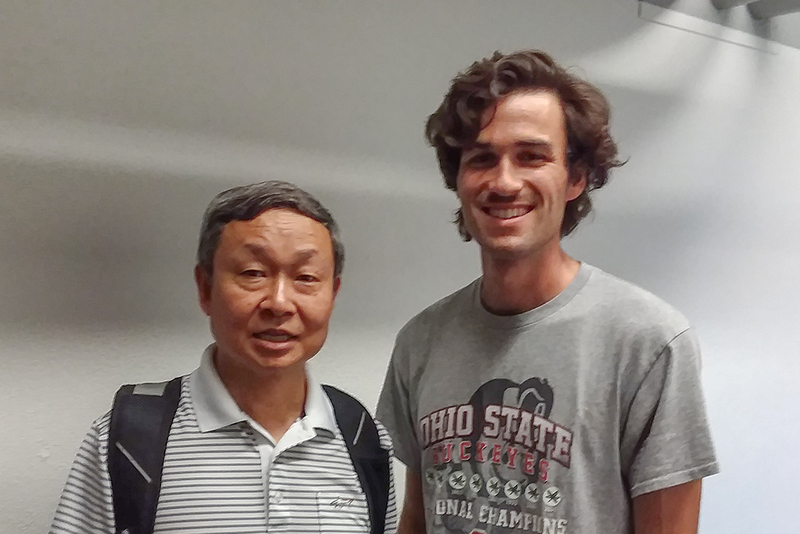 University of Arizona's Xubin Zeng and Josh Welty. Experimental explanation of supercooling : why water does not freeze in the clouds, European Synchrotron Radiation Facility Website, April 21, 2010. Watch supercooled water freeze, European Synchrotron Radiation Facility YouTube video, April 22, 2018. Haishui Huang, Martin L. Yarmush, and O. Berk Usta, "Long-term deep-supercooling of large-volume water and red cell suspensions via surface sealing with immiscible liquids," Nature Communications, vol. 9, Article no. 201 (2018). This is an open access publication with a PDF file here. Janet Pelley, "Does cloud seeding really work?" Chemical & Engineering News, vol. 94, no. 22 (May 30, 2016), pp. 18-21. J. Welty and X. Zeng, "Does Soil Moisture Affect Warm Season Precipitation Over the Southern Great Plains?" Geophysical Research Letters, Early View Online Version, July 25, 2018, https://doi.org/10.1029/2018GL078598. Martha Retallick, "Does Rain Follow the Plow?" University of Arizona Press Release, August 8, 2018. Linked Keywords: Science; scientific; education; textbook; chemistry; beard; bearded; chemist; crystallization; crystallizing; product (chemistry); solution; crystal; nucleation; nucleate; dust; women in STEM fields; gender imbalance in STEM fields; gender gap in the sciences; ice; Celsius; °C; liquid water; supercooling; supercooled; melting point; freezing point; Daniel Fahrenheit (1686-1736); Fahrenheit temperature scale; YouTube; plastic; bottle; kitchen freezer; impact; strike; P-wave; pressure wave; commemorative plaque; birthplace; Gdansk, Poland; Dutch Republic; Dutch Golden Age; Wikimedia Commons; Starscream; cloud; aircraft; atmospheric icing; temperature; icing conditions; flight; fatal air crashes; lithosphere; ground level; electric power transmission; overhead electric power line; wind turbine; aircraft; icing; NASA; Glenn Research Center; Lewis Research Center; research; Harvard Medical School; Shriners Hospitals for Children (Boston, Massachusetts); Rutgers University (Piscataway, New Jersey); aqueous; interface (chemistry); atmosphere of Earth; air; shelf life; biology; biological; human red blood cell; oil; hydrocarbon; alkane; primary alcohol; milliliter; volume; conjecture; conjectured; molecule; coordination number; five-fold coordination; translational symmetry; periodic repetition; tessellation; space-filling; scientist; French Alternative Energies and Atomic Energy Commission; Commissariat à l'Energie Atomique et aux Energies Alternatives (CEA); Centre National de Recherche Scientifique (CNRS); European Synchrotron Radiation Facility; experiment; gold; silicon; alloy; magazine; 1950s; science and technology; World War II; a chicken in every pot; automobile; driveway; decade; plethora; cloud seeding; rain; rainmaking; precipitation (meteorology); General Electric; Vincent Schaefer; Bernard Vonnegut; author; Kurt Vonnegut; silver iodide; hexagonal crystal system; hexagonal crystalline structure; protein; Pseudomonas syringae; bacteria; Wyoming Weather Modification Pilot Project (WWMPP); winter months; mountain; Wyoming; snow; snowfall; statistics; radar; quantification; quantify; National Academy of Sciences; anecdotal evidence; car wash; washing the car; umbrella; folklore; 19th century; tillage; cultivation; semi-arid; arid; US Great Plains; topsoil; humidity; humidify; map; United States; temperate grassland; color; scientific literature; scientific publication; University of Arizona; doctoral student; Joshua Welty; doctoral advisor; thesis advisor; Xubin Zeng; Land-Atmosphere-Ocean Interaction Group; U.S. Southern Great Plains; open data; open-source data; United States Department of Energy; Southern Great Plains (SGP) atmospheric observatory; southern; Kansas; northern; Oklahoma; June; September; afternoon; wind; conveyor belt; water vapor; NASA; Stacy Pigott.